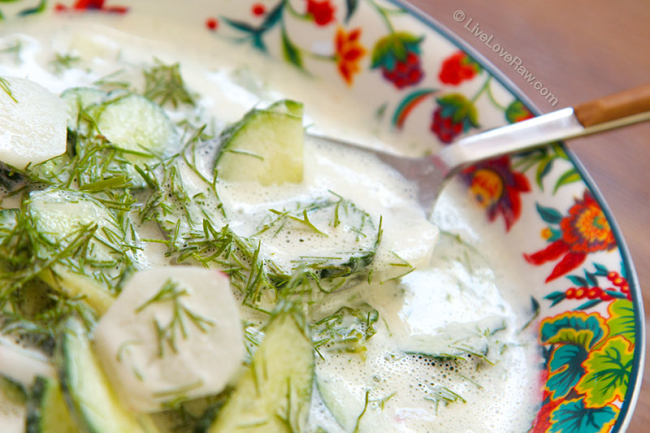 If you’re looking for something different, try an “okroshka” – a Russian cold summer soup. It may not look like a traditional soup, but all of my students and customers absolutely love it! It is traditionally made with “kvass”, a beverage made from fermented bread or with something dairy-based, like kefir. I never liked kvass or kefir, but when I decided to re-create it raw, I was amazed at how delicious it can be!! It’s so fast and easy to make and is a wonderful meal for the summer. This is such a great recipe to make your own, as you can add anything you like to it, what I show in the video is just the base really, for when you have nothing in the fridge. I have updated the recipe a little bit to make it taste even more like the original. Please feel free to substitute the ingredients as you wish, after all, the word “okroshka” comes from the word for “to crumble”, so you can crumble anything into it! Any other vegetables you like, e.g. peppers, spring onions etc. Mash half of an avocado and cut the other half into small cubes. Chop all the remaining vegetables into small cubes (or semi circles). Put them in a large soup bowl. 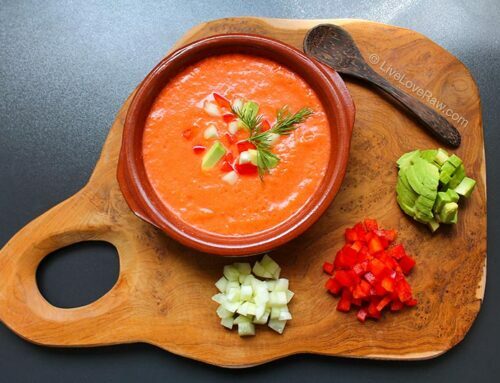 Blend all of the soup ingredients in a high speed blender and add to the vegetables. Serve cold, I even put it back in the fridge for a bit before eating it as it tastes best after a few hours in the cold. Even better on the next day in fact! This is great! I am very fond of this soup’s original version with sour milk. I am definitely going to try this raw vegan one.